CSR-Governance | KOITO MANUFACTURING CO.,LTD. The KOITO Group’s basic approach to corporate governance is to recognize the importance of ethical standards and sound management so as to retain the trust of all its stakeholders. Based on this approach, KOITO is making efforts to enhance corporate governance and strengthen compliance. At KOITO, the Board of Directors conducts management decision-making and supervision in accordance with KOITO's regulations, as well as directors and corporate officers conduct business execution, and audit and supervisory board members audit the execution. 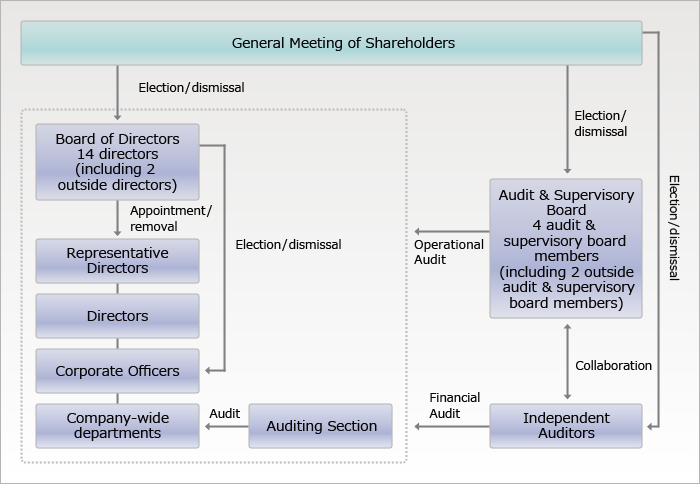 The Board of Directors, which comprises 14 directors (including 2 outside directors), in principle meets once per month and is attended by directors and audit and supervisory board members. It reports on progress in business execution and makes decisions on important matters. The Managing Committee comprising full-time directors and a corporate officer, is a body to aid the Board of Directors. The committee meets in principle 3 times per month and determines business execution, and reports on progress in and follows up on business execution. As determined by the Articles of Incorporation, the Board of Directors comprises 15 members or less. The Audit and Supervisory Board comprises 4 audit and supervisory board members (including 2 outside audit and supervisory board members). Each audit and supervisory board member audits the performance of directors in line with auditing policies through their participation in meetings of the Board of Directors, and surveys of the Company’s operations and financial condition. Moreover, the standing audit and supervisory board members attend the Managing Committee and other important meetings or committees to audit business execution by directors. Accounting audits are conducted by ARK MEIJI AUDIT & Co.. The KOITO Group’s key management policies are to anticipate customers’ lighting needs, thereby contributing to social progress and development, and to ensure co-existence and co-prosperity with all stakeholders including shareholders, customers, employees and trade partners. We recognize the seriousness of global environmental problems and strive to preserve the environment by pursuing “Eco-Friendly Manufacturing for People and the Earth” in all our activities. To carry out these policies and activities, we not only observe various national and international laws, rules and their spirit that companies are expected to observe, but also follow corporate ethics in our actions, based on the following ten principles. We gain customers’ satisfaction and trust by developing and offering safe and high-quality products and services. We observe relevant laws and rules and conduct proper trade based on fair, transparent and free market competition. We communicate with various members of society, including not only our shareholders but also trade partners and local residents, and strive to disclose our corporate information appropriately and fairly. We respect the diversity of our employees and the character and personality of each of them, regardless of nationality or gender, and strive to build a safe and clean environment where each worker can make best use of their capabilities and fulfill their potential. We take the initiative and set an example in protecting the global environment through activities on the theme of “Eco-Friendly Manufacturing for People and the Earth”. We are aware of our responsibility as a good corporate citizen and actively carry out social contribution activities to help create a better society. We have no relation whatsoever and deal resolutely with any anti-social force or group that threatens the order and safety of society. In our global corporate activities, we not only observe international rules and local laws but also respect local culture and customs. Our corporate managers are aware of their duty to comply with the spirit of this Charter. They take the lead and set an example in observing these principles, and make the KOITO Group companies and trade partners familiar with the principles. Furthermore, they grasp opinions inside and outside the companies at all times, manage an effective company structure, and ensure that corporate ethics are strictly observed. In the event of a breach of this Charter, our corporate managers will express, internally and externally, their will to solve the problem themselves, clarify the facts and strive to investigate the cause and prevent recurrence. In addition, they will disclose information to society promptly and adequately and assume accountability, and severely punish those involved, including themselves, after clarifying their authority and responsibility. The Compliance Committee, Compliance Department, Internal Audit Department, whistle-blower internal reporting system and other organizations and systems, as well as the Code of Corporate Ethics and other relevant regulations, will be developed and enhanced based on the KOITO Group Corporate Behavior Charter. At the same time, KOITO’s directors, corporate officers and employees will receive education familiarizing them with the organizations, systems and regulations. Regulations will be developed and enhanced to appropriately preserve and administer minutes to the General Meeting of Shareholders, Board of Directors, Managing Committee, and other information on directors executing their business duties. Risk Management Regulations and other regulations and systems for managing risk will be developed to avoid and eliminate material risks that could threaten the Company’s survival, and minimize the impact when they arise. At the same time, KOITO’s directors, corporate officers and employees will receive education and training on risk management. Board of Directors and Managing Committee will be held regularly. Meanwhile, Board of Directors Regulations, Managing Committee Regulations and other regulations pertaining to the execution of business duties by directors, as well as the corporate officer system and other organizations and systems, will be developed and enhanced to ensure the efficient execution of business duties by directors. At the same time, business duties will be executed according to specific plans the divisions develop each year based on the president’s policy. KOITO and its Group companies will subscribe together to the KOITO Group Corporate Behavior Charter and develop a system for ensuring and administering the appropriate execution of business duties. Based on the Affiliates Management Regulations, etc., KOITO will specify matters to be reported by affiliates, enhance the Group’s reporting system, and ensure that Group companies file periodical reports to KOITO. Based on the Affiliates Management Regulations, etc., KOITO will keep watching on risks to the Group as a whole in a comprehensive and centralized manner. Whenever it finds insufficiency in a Group company’s action, etc., KOITO will give it guidance or take other corrective measures. KOITO will ensure that Group companies prepare and keep their regulations, organizations, and systems to ensure periodical Board of Directors and directors’ fulfillment of their duties. For important affiliates, directors of KOITO may concurrently hold offices of directors of such affiliates. Based on the KOITO Group Corporate Behavior Charter, etc., KOITO will ensure that Group companies achieve compliance (with laws and ordinances) and KOITO's administrative and Internal Audit Department audit affiliates' operations and accounting. Further, based on the Affiliates Management Regulations, etc., KOITO will specify matters subject to KOITO’s approval, and ensure that Group companies first obtain KOITO’s approval before carrying out such matters. An Audit and Supervisory Board Member's Office will be established to help the audit and supervisory board members execute their duties under the instruction and order of the audit and supervisory board members and the Audit and Supervisory Board. Moreover, assignment of personnel to the Audit and Supervisory Board Member's Office shall be decided upon approval by the Audit and Supervisory Board to ensure independence from directors. Directors, corporate officers and employees of KOITO and its Group companies shall report to the audit and supervisory board members when they learn of matters of material impact on the Company, serious violations of laws, regulations and the Company’s Articles of Incorporation, and other issues of compliance. Moreover, each audit and supervisory board members shall exercise their own discretion in reporting the findings from such reports to the Audit and Supervisory Board. Meanwhile, the Company’s organization and systems will be developed and enhanced to rigorously prevent the unfair treatment of directors, corporate officers and employees for reporting to the audit and supervisory board members. The Company shall pay all necessary expenses involved in the audit and supervisory board members executing their duties. The audit and supervisory board members shall monitor and audit the execution of business duties at the Company by means that include attending the Board of Directors, Managing Committee, Compliance Committees and other relevant conferences and committees, and examining important documents. The audit and supervisory board members shall exchange opinions periodically, or as need be with directors, corporate officers, independent auditors, and the Internal Audit Department, among others. Copyright © KOITO MANUFACTURING CO., LTD. All Rights Reserved.